Despite a computer glitch that led a Muni 3-Jackson trolley bus to crash into a parked vehicle late Monday morning, transit officials say the trolley buses are safe. Initial reports said Monday’s crash, which occurred near Jackson and Scott streets, was caused by failing brakes. However, a memo obtained by The San Francisco Examiner states the incident was actually caused by a malfunctioning computer system on the bus that was unable to communicate with the brakes. John Haley, director of transit for the San Francisco Municipal Transportation Agency, wrote in the memo to Mayor Ed Lee and the directors of the SFMTA board that when the operator applied the foot break, it should have sent a signal to the traction motor to decelerate, but it did not. Other operators reiterated the same story, reported the Examiner. Brake failures are another problem operators said they experience on the trolley buses. However, Rose said if a trolley bus has battery power, steering should continue to work. He countered that the bus does not lose the brakes in restrictive mode, which transit officials confirmed with SFMTA mechanics Friday morning. A computer error that cut signals to the brakes was found to be the culprit in a Monday morning Muni bus crash, and the San Francisco Examiner has learned that other braking problems may be widespread in the same type of bus, the most decrepit in Muni’s fleet. One bicyclist was killed and another seriously injured in two separate accidents that occurred within a half-hour in downtown San Francisco on Sunday afternoon. Where the “Google buses” go, evictions follow. And those private shuttles are expanding all across The City, with more than 20 new stop locations and over 900 more annual pickups made by shuttles so far in 2015, compared to last year, according to new data. Those are the assertions of the Anti-Eviction Mapping Project and some advocates suing San Francisco and various tech companies. The goal of the suit is to compel an environmental review of the Commuter Shuttle Pilot Program, which legalized private commuter shuttle activity. The data on the growing number of private commuter shuttles, nicknamed “Google buses” comes via public records requests of the San Francisco Municipal Transportation Agency by activist Sue Vaughan. Vaughan is one of the litigants in the lawsuit, along with local activist Sara Shortt and the local SEIU. Mapping project activist Erin McElroy famously protested a Google Bus in 2013, along with groups like Heart of the City, demanding Google and other tech companies help stem evictions. “We found that evictions were up 69 percent more in proximity to [shuttle] stops between 2011 and 2013,” McElroy said, adding the newer commuter shuttle stops would likely bring higher rents and evictions. When the San Francisco Examiner asked SFMTA if they had studied the correlation between evictions and shuttle stops, they said questions should be referred to the Planning Department. The SFMTA is using our tax dollars to hire lobbyists in Sacramento, and possibly Washington to change the laws in favor of the tech buses. This is especially concerning because no other city has this problem that we know of. Please let us know if there are other cities, particularly in California that have tech buses. A gentrification report came out, or was discovered on twitter this week that shows a strong correlation between the transit-oriented development and gentrification that further proves the point many have been making for some time. The goal is to build, not build a green or clean city. Just build, and any story, no matter how true, will do to get that next project approved and shift the demographic in San Francisco to one that can be easily controlled. The question that arises out of this realization is: Should the regional transportation agency be elected? As the crow flies, they’re not so distant from The City’s urban core. But a lack of direct connection to BART, Muni’s train lines and Muni’s main commuter buses, make the so-nicknamed Outerlands feel worlds away from the rest of San Francisco, residents say. Amid this transportation drought the San Francisco Municipal Transportation Agency announced new transit increases on the west side as part of its Muni Forward plan. For those living south of Lake Merced, however, the changes are a double-edged sword. Residents say the re-routes will further distance them from downtown, stranding them at the southern tip of the lake. Hundreds in the southern and westernmost corner of San Francisco will soon lose access to the 18-46th Avenue line, a crucial connector between Lake Merced and more robust transit options near Stonestown Mall. Starting Sept. 26, the 18-46th Avenue will reroute to better serve Lowell High School and the dense neighborhoods near Sloat Boulevard. •The 57 Parkmerced will run every 20 minutes instead of 30 minutes. •The 18 46th Ave will run every 20 minutes instead of 25 minutes on weekends. •The 57 Parkmerced will pick up and drop off at Daly City BART. •18-46th Avenue customers along Lake Merced will now be served by 57 Parkmerced. We stated clearly in past memo’s and submitted documents that their is a distinct need to solve the major jumps, and missing connectivity on the city’s SW and SE corners. 19th Ave and 101 @ Candlestick up through the hospital curve both require more solid planning transit work. The SFSU-CSU masterplan increased enrollment, reduced shuttle services and left 60-80 people in line for shuttles daily. The SFSU team painted the poles purple and yellow at the prior Parkmerced/SFSU-CSU stop, not much more was done to improve two-sided access to the platform and the overwhelming crush that occurs there daily. 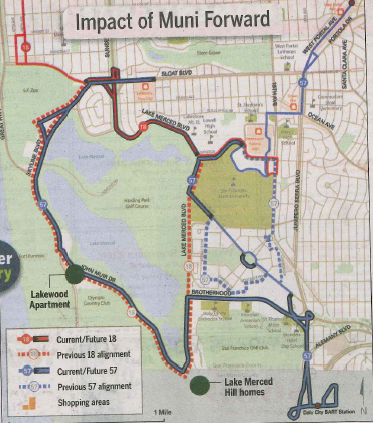 The Lake Merced area is completely underserved, while Parkmerced pressures to build alongside the 800 Brotherhood way developments at 19th and Brotherhood there is no significant planning efforts that produce up front changes to connect link and loop the transit systems to provide these areas with secondary connectivity to major transit hubs. Parkmerced’s changes strand seniors further from the main line, and reduce access to the disabled. The Parkmerced changes wait 30-40 years to do the connectivity needed across brotherhood way and to any future intermodal facility at Daly City BART. The L-Taraval shown on the map shows how short a distance it would be to connect direct up Sloat Blvd. the L line and possibly link it along Lake Merced Blvd. out to Daly City and possibly back up John Daly Blvd. as a Bi-County project to improve cross county traffic concerns. Even routing it up Brotherhood Way or looping it around the lake to the Pomeroy Center, Golf Course, and housing areas, would make sense even if a secondary system around the lake. Development of many sites in D10 requires more adequate public transit systems to solve the accessible issues for many low-income families needing to get downtown or across town for jobs and schools. Meanwhile the SFMTA/SFCTA propose BRT transit along Geneva when its already obviously clear the LRV route is needed sooner and not later, with proposed projects, cummalative impacts, and the new projects near Balboa Park Station that will bottle up the access to any future planned intermodal facility at this location near the Geneva Car-Barn and major highway access areas of the SE-SW corridor. The systemic problem is that we need funding, and we also need resolve. We need a bit more creativity in solving the problems, and a stronger will to not just take a developer’s plan as the holy-grail, but make sure we vet the suggested options and alternatives that can provide these residents and existing neighborhoods with the proper public transit levels needed. Its not out of the financial possibility to get our systems in such a small city up to par, it just will take the public demanding that the city is not adequately serving the public’s needs and put the focus on the planners to get those links, loops and connections in the system built first, and not post more subway tunneling that may drain funds for outside areas of SF at the behest of downtown interests. 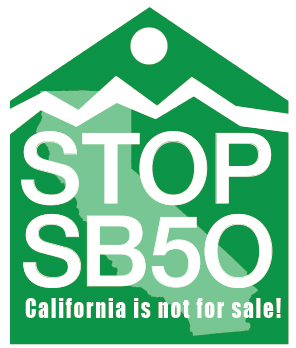 Taxation of business, institutional growth (SFSU-CSU), and market rate housing development is critical to ensuring that the developers don’t rely on the public taxation to fund their growth. Raise the tax amount by 50% over the currently submitted amounts proposed by the SF Planning Commissioners, its time we think about the cities future, and if we will strand the public and force them to take cars, or adequately plan for a system-wide improvement especially in districts currently under-served by the system. I’m on the Valley Transportation Authority’s Line 22 bus somewhere between East San Jose and Palo Alto. It’s 2:30 a.m., and it’s raining. I start a conversation with a man sitting down, and ask him if he’s heard the nickname for the bus. I ask him what he calls the bus. The San Francisco Municipal Transportation Agency (SFMTA), which oversees all transportation in the city, including Municipal Railway (Muni), announced today that it will receive grant funds from the Federal Transit Administration’s (FTA) new Ladders of Opportunity Initiative. These funds will allow Muni to add twelve, 60-foot buses to help meet the growing demand of the city of San Francisco’s transit needs, address existing crowding, improve service reliability, and increase economic opportunity by improving access to jobs and services. The number of Muni buses that can legally have wraparound advertisements was doubled by San Francisco supervisors Tuesday, despite objections that the banners would degrade rider experience. Weeks after anti-displacement organizers on two instances blockaded commuter buses with tech workers from leaving The City, transit and city officials on Monday formally announced an 18- month pilot program allowing shuttle providers to use select Muni stops for a fee. The proposal, which will be taken to the San Francisco Municipal Transportation Agency on Jan. 21, would allow the shuttles to use 200 of the more than 2,500 stops in Muni’s system for $1 per stop per day. The city conducted an undercover audit of Muni buses and also audited their books to produce a report that, once again, shouts loud and clear that our public transportation system has problems. The report, which we’re not finding on the city website yet, seems to focus primarily on bus drivers and the ongoing shortage of drivers that ends up slowing the entire system down due to too many drivers taking leave. But it also includes a delightful description of a Muni driving instructor asleep aboard a training bus while a rookie driver navigated through busy traffic. Muni cancelled 14,017 bus runs last year, or about 38 runs a day, due to drivers on sick leave, or the driver shortage in general. This is why that 22-Fillmore you were waiting for took so goddamn long to show up. They spent $4.7 million in extra overtime in order to make up for the shortage of trained drivers. They’re short about 100 drivers, and no one has done a good staffing analysis to determine how many drivers they need to maintain in their ranks. They’re also short on driving instructors, partly because the instructor gig doesn’t pay overtime. Half of the new-driver training classes scheduled in the first half of this year were cancelled because of instructor absenteeism. The instructor caught sleeping on the job wasn’t fired, and is now a Muni supervisor.